Why staying true to your values and keeping informed will help secure the right outcomes for children, despite the latest and ongoing challenges presented by uninformed reports and government policy. Early years educators, particularly those working in schools, could be forgiven for experiencing a sense of ‘besiegement’. Two recent events have focused attention on the Early Years Foundation Stage (EYFS) in general, and the reception year in particular, creating concern that fundamental, long- standing, non-negotiables of effective pedagogy are being undermined. The DfE’s response to the Assessment Consultation proposed a new Baseline for the reception year that would specifically ‘not’ be based on observational assessment, nor have any formative value. It suggested a ‘narrowing down’ of the areas assessed by the EYFS Profile and potential changes to the content and pitch of the Early Learning Goals (ELGs). Ofsted’s Bold Beginnings recommends that learning to read should be considered as the exclusive ‘core purpose’ of reception focusing on the necessity of specifically teaching ‘correct pencil grip’ and ‘how to sit correctly at a table’. These events, although apparently unrelated, certainly appear to add to a growing sense of concern that the uniqueness of the EYFS and the specialist nature of how to support the most effective learning is firmly in the crosshairs of the powerful uninformed. The feeling is not new – the barrage of misunderstanding and need to continually justify why we do what we do, and the distinctiveness of how we need to do it, has always been a feature of our role. I do not think that this is inherently malicious, but more borne out of the lack of acceptance of the ‘inconvenience’ and ‘otherness’ of early childhood development. Although the EYFS and Pro le have been reliable statutory bulwarks against the worst excesses of these uninformed assaults, the fact that these are now apparently under threat gives us a sense of the escalation in challenges we seem likely to face. Last month, at Early Excellence, we held our annual National Conferences. Nestled in between a clinical and scientific view of child development delivered by a developmental psychologist, and a celebration of successfully transformative EYFS practice delivered by an Early Excellence curriculum adviser, I explored the concept of developing a ‘Responsible ECE Pedagogy’. Although we may live in a changing educational world, where initiatives – and education secretaries – may come and go, our responsibility – our ‘core purpose’ – is to ensure that we provide the best possible learning experiences and opportunities for children. is will not, and should not, change. Although children are fundamentally the same, what we know, understand and discover about the nuances of how they learn and develop constantly reshapes, challenges and develops our thinking and practice. 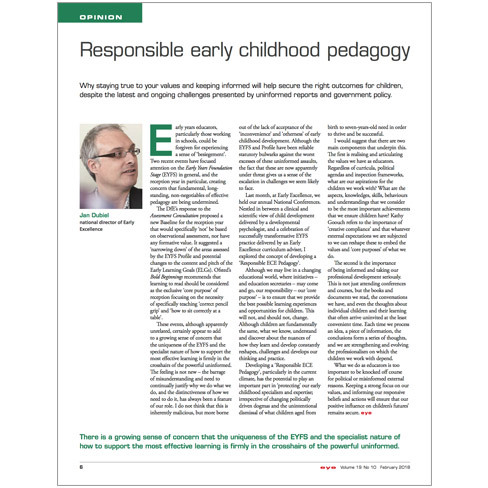 Developing a ‘Responsible ECE Pedagogy’, particularly in the current climate, has the potential to play an important part in ‘protecting’ our early childhood specialism and expertise; irrespective of changing politically driven dogmas and the unintentional dismissal of what children aged from birth to seven-years-old need in order to thrive and be successful. I would suggest that there are two main components that underpin this. e rst is realising and articulating the values we have as educators. Regardless of curricula, political agendas and inspection frameworks, what are our aspirations for the children we work with? What are the aspects, knowledges, skills, behaviours and understandings that we consider to be the most important achievements that we ensure children have? Kathy Goouch refers to the importance of ‘creative compliance’ and that whatever external expectations we are subjected to we can reshape these to embed the values and ‘core purposes’ of what we do. The second is the importance of being informed and taking our professional development seriously. is is not just attending conferences and courses, but the books and documents we read, the conversations we have, and even the thoughts about individual children and their learning that often arrive uninvited at the least convenient time. Each time we process an idea, a piece of information, the conclusions form a series of thoughts, and we are strengthening and evolving the professionalism on which the children we work with depend. What we do as educators is too important to be knocked o course for political or misinformed external reasons. Keeping a strong focus on our values, and informing our responsive beliefs and actions will ensure that our positive influence on children’s futures’ remains secure. There is a growing sense of concern that the uniqueness of the EYFS and the specialist nature of how to support the most effective learning is firmly in the crosshairs of the powerful uninformed.